Diebolt-Vallois is a a producer located in Cramant in the Côte des Blancs, famed for its Chardonnay. No surprise then they make wonderful Blanc de blancs, and have been garnering more and more attention. Technically a Negociant since 2004 instead of a Grower-Producer, they buy some grapes primarily from Jacques Diebolt's father in law and also some from Bernard Tornay to make Rose. Although technically and legally a Negociant, they are practically and spiritually a Grower-Producer (did I really use "spiritually" in this context? I must be a Champagne Geek!). They have 11 hectares of vines located primarily in Grand Cru Cramant and Premier Cru Cuis, with some additional plots of vines in Chouilly and the hillsides of Epernay. These are all Chardonnay. They also have a few plots planted with Pinot Noir and Pinot Meunier in Montagne de Reims and the Côte de Bar. The grapes are hand picked. Each plot is vinified separately. Fermentation, depending on the wine, is done in thermostatically controlled vats or wooden barrels. Malolactic fermentation occurs in all wines except their best wine, the Fleur de Passion. .Dosage is usually low and 6 to 8 grams per liter. 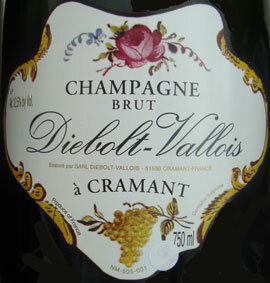 The Diebolt family has been kicking around Cramant since the late 19th century and Jacques has made wine since the 50s, Diebolt-Vallois was created when Jacques Diebolt married Nadia Vallois. In 1978 Diebolt's vineyard holding were enormously enhanced with some from the Vallois family, and the cellars and winery were built. Today is it run by Jacques and Nadia along with their two children. Tradition Brut - their entry level wine, and their only non-Rose wine that is not 100% Chardonnay. It is made from 40% Chardonnay and usually slightly more Pinot Noir than Pinot Meunier. Tasting note below. Rose NV - primarily from Les Toulettes in Epernay, this is 63% Pinot Noir, 27% Chardonnay, and 10% Pinot Meunier with the addition of still Pinot Noir from Bouzy. Blanc de Blancs NV - 100% Chardonnay from vineyards in the Cote des Blancs and Coteaux d'Epernay. Vintage Blanc de Blancs or Champagne Millésimé - 100% Chardonnay from one year only, and only made in the best years. This wine has received accolades from the critics. Tasting note below. Blanc de Blancs Prestige - 100% Grand Cru from Cramant and a blend of three years. Another one the critics love! I do too, see the tasting note below. Fleur de Passion - also 100% Grand Cru from Cramant, from a few select old vine hillside plots 40 years old minimum. A vintage wine. Barrel fermented, with no malolactic fermentation, filtration or fining. Aged in old Burgundy barrels. Critic do back flips over this although I have yet to procure a bottle. Tasting Note: Diebolt-Vallois Brut Tradition - Dec 2012 - rated B/B-.A solid wine but most critics overrate this in my opinion. The nose has fresh cut apples and minerals. Some floral notes. The palate is quite lively and refreshing tasting with a cheerful apple juice taste initially. Very fruity with good balancing acidity. Some minerals. Nice, but a bit simple and too fruity. A good Champagne for sure, nothing wrong with it but it doesn't excite me. 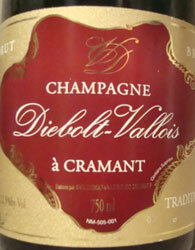 Tasting Note: Diebolt-Vallois Blanc de Blancs Prestige - January 2013 - rated A- and "Ohhh My!" A chalky minerality with light fruits on the nose and slight yet not acidic citrus. A delightfully restrained spicy maritime quality. The palate is immediately very creamy and fresh tasting upon opening. High toned and lovely fruits; a veritable fruit medley; quite precise yet undistinguishable initially. With air and warming, there is pear, high toned red apple, spicy apple, and plentiful traces of orange or tangerines on the end. Very happy I've got another bottle and a magnum left of this! 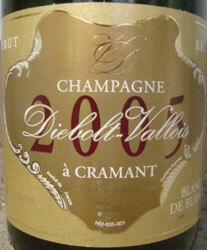 Tasting Note: Diebolt-Vallois Blanc de Blancs 2005 - January 2013, rated B+ and it may improve to A- with time. I have another bottle I'll try in perhaps a year or two. A very light yellow with superfine bubbles. The nose is fine white beach sand, with a little apple and citrus initially. Chalk and creaminess as it breathes. The palate is a wonderful rolling apple with low acidity and gentle lime. The interplay of apple and lime are wonderful and delicately balanced. Certainly a wine of finesse. Plenty of minerals add to the mix 15 minutes after opening as well. Touch of watermelon rind. Cantaloupe on the aftertaste. The palate is far more expressive than the nose right now. A solid wine but I greatly prefer the Blanc de Blancs Prestige above at this point in time.